Mickey’s Diner has everything a diner should have: greasy food, thick milkshakes, jukebox tunes, and cranky waitresses. Serving up good eats and free downtown parking 24 hours a day since it opened in St. Paul in 1939, this restaurant was designed to resemble the dining railroad cars of its time. I remember coming here as a kid from the Minnesota suburbs and falling for its train-like appearance and neon sign out front. Mickey’s felt almost magical to me, like stepping into an imagined scene from my parents’ childhood. I think it’s why, to this day, I feel compelled to stop into any diner I stumble upon for some simple fare and retro ambiance. 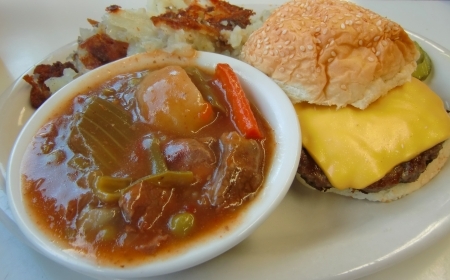 There’s no children’s menu but food is affordable at Mickey’s Diner. Even picky eaters can find something they like here from hamburgers and B.L.T.s, to eggs and pancakes from their all-day breakfast menu. I found the fried chicken a little bland and dry but the burgers were a big hit with my teenage triplet niece and nephews. My sister wished she could have a second serving of Mickey’s Mulligan stew. And although I’m not typically a baked beans kind of a gal, I gobbled up my side of homemade brown-sugared, not-too-mushy legumes. Of course, you’ll want to get a shake or malt. Choose from vanilla, chocolate, banana, raspberry, or strawberry. They’ll even split your choice in half (or thirds) for those with small stomachs or considerable restraint. I’ve got good news and I’ve got bad news. 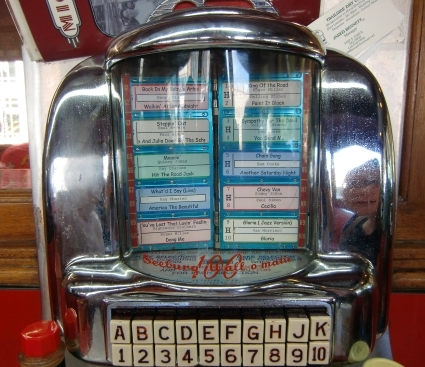 The good news is the mini jukeboxes perched on every table really work and play oldies by artists like Elvis Presley, Hank Williams, and Patsy Cline. The bad news is your 3-year-old (if he’s anything like mine) will be so enthralled with this contraption that he will take only a bite or two of his grilled cheese sandwich. Instead he will insist on putting change into the machine again…and again…and again. Luckily, he will like to press the return change button more than actually playing music, so this activity won’t cost much. 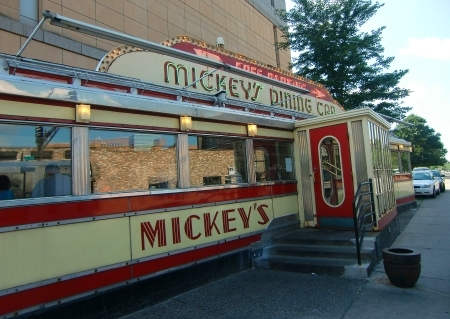 Read more about Mickey’s Diner on TripAdvisor. Where is your favorite diner? Tell us in the comments! Joann – I didn’t know you were from Minnesota! You absolutely must stop by Mickey’s with the kids the next time you head home!